For a few months now, I've been dreaming about making pie. 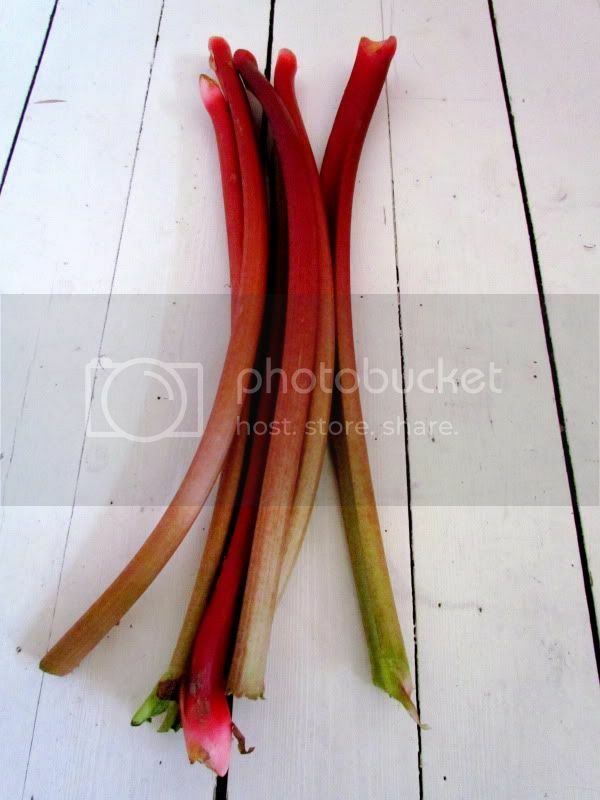 In May, I found lovely fresh rhubarb and preserved their goodness by cubing them and freezing them away. And it's been lying in wait ever since, for it's partner, the gentle strawberry. Strawberries have started to emerge slowly and are now everywhere. If you ever come to Sweden, you must try two things: strawberries and wild strawberries -- smultrons. The best time to enjoy them is in the summer, and no Swedish summer is complete without them. Smultrons can only be found in the woods and countryside, but it's worth the hunt because their taste is tart and sweet with an intense strawberry perfume. So after finding the best fruit, making pie dough is probably the biggest challenge. In my time, I've baked a-many pies and tarts with tough crusts, sometimes even raw. But I've learnt from my mistakes because I'm eager to get it right. The main problem I used to have is cutting down on the fat too much, which I don't try to do anymore. I accept that fat is necessary for a beautiful flakey tender pie crust. But that didn't stop me from messing around! I decided to use coconut oil along with butter for some peace of mind. And it works wonderfully, produces a beautiful crust! I didn't taste coconut at all, but the butter isn't as buttery as an all-butter crust. You decide, maybe you want to use 3/4 butter and 1/4 coconut, but since this pie uses a lot of crust, I prefer the half to half ratio. Some friends were coming around for dinner yesterday so I took the opportunity to make the pie I've been dreaming about. My lovely husband suggested adding cardamom to the mix because we were eating Indian for dinner, and our wedding pie was strawberry rhubarb scented with cardamom! If you've never tried cardamom with rhubarb, you simply must! They are best friends. 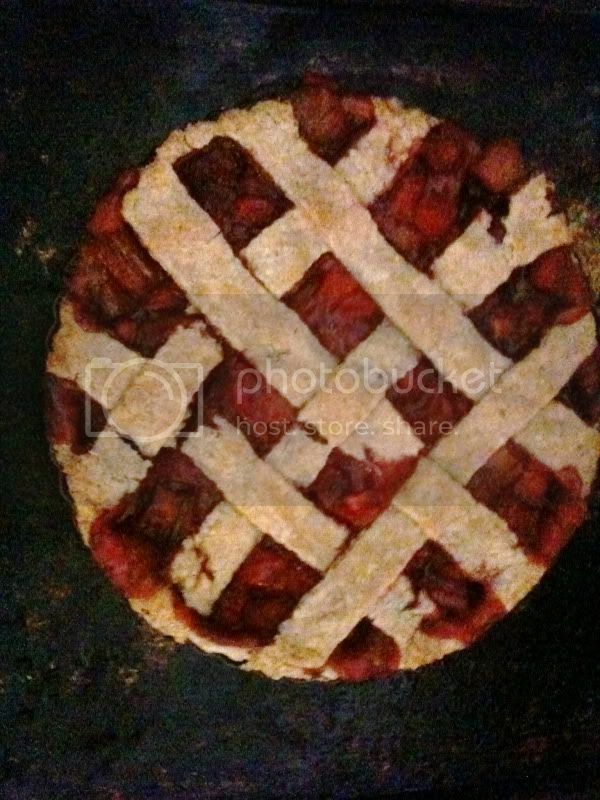 In fact, strawberry, rhubarb and cardamom are the best of friends, well, in a buttery flakey tender pie crust! We enjoyed the pie with vanilla ice cream, although dare I say it, it tastes best alone! 1. Mix the flours with salt and grate in the coconut oil. Then, rub in the butter into the flour-coconut mixture until the butter is broken down into smashed chickpea-size pieces. Add the water and vinegar and bring together into a clump. Divide into 6 clumps. Using the palm of your hand, push each clump of dough outward -- this mells the fat with the flour and creates flakiness. Bring together and wrap tightly and refrigerate for 1 - 2 hours. 2. 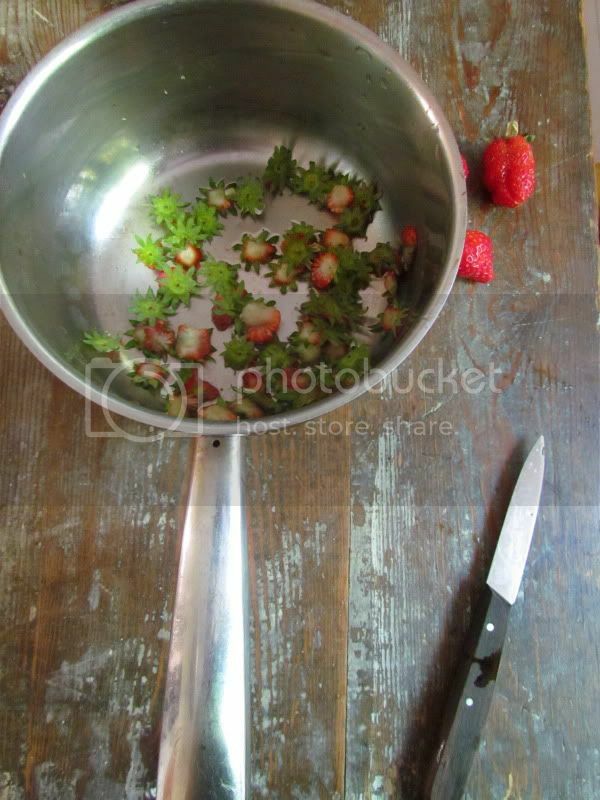 In a bowl, combine rhubarb, strawberries, cardamom, salt, sugar and 2 tbs corn/potato starch. 3. Divide the dough in half and roll into 1/8 inch thickness and line a 9 inch tart pan. Wrap and refrigerate. 4. While the tart shell is chilling, use the other half of the dough to make another large circle with the same thickness. Cut into strips, about 2 inches wide. PREHEAT oven to 180C or 350F. Prepare the rack to the lower third of the oven. 5. Take out the tart shell and place on a sheet pan. Sprinkle the remaining 1/2 tbs corn starch evenly on the bottom of the tart shell. Add the filling and carefully line the strips to create a lattice. Bake for 40 - 50 minutes, until golden and bubbling. Cool completely before cutting.